“Healing for the Brokenhearted” from Christian Faith Publishing author Dr. Etta Lipson is a guide to moving on from devastation and pain to the pinnacle of hope in God’s mercy and love. This book outlines eight gifts from God and provides power Scriptures in each section to enhance the reader’s knowledge of His truth. “Healing for the Brokenhearted”: a spiritual guide developed by the author throughout twenty-five years in Christian ministry. “Healing for the Brokenhearted” is the creation of published author Dr. Etta Lipson, an attorney, educator and pastor dedicated to helping others through faith and to the advancement of God’s kingdom on Earth. Published by Christian Faith Publishing, Dr. Etta Lipson‘s new book outlines God’s plan to bring peace and joy to us in the midst of trouble. View a synopsis of “Healing for the Brokenhearted” on YouTube. Readers can purchase “Healing for the Brokenhearted” at traditional brick and mortar bookstores, or online at Amazon.com, Apple iTunes store, Kobo or Barnes and Noble. 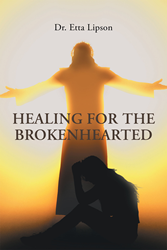 For additional information or inquiries about “Healing for the Brokenhearted”, contact the Christian Faith Publishing media department at 866-554-0919.